Before you start, see how an expert builds a deck. Decks are popular projects for pros and homeowners but there are safety issues, building codes, and hidden problems to address upfront and throughout the process. This video takes place on an actual job site and includes some not-so-perfect moments to prepare you for what can happen. With fewer surprises, you'll get better results. Follow a master builder from footings to final trim. Master builder Rick Arnold walks you through every step of the project and points out potential problems - such as hidden rot, those all-important ledger board issues, and load capacity. And shows you how to remedy anything that might adversely affect your new deck. Learn the techniques to get it right. Watching this video will save you time because you'll thoroughly understand the process. If you square up the deck correctly at the outset - and check that it remains square at critical times - you'll avoid bigger problems down the line. And you won't ever have to explain why your deck is a little off kilter. That's just one of many reasons why this video is worth watching and reviewing. Be aware of code requirements. Throughout the video, you'll be alerted to issues that may be regulated by local building codes. This will save you time and avoid the possibility of being denied a permit, or having to make costly changes, or re-do work to meet the proper requirements. Working with the newest materials. You'll do a much better job when you know what materials to use and how to work with them. Here are just some you'll be introduced to: builder's forms for footings, proper hardware and hangers, synthetic decking, railings, and decorative trim. Invest 44 minutes for years of pleasure. 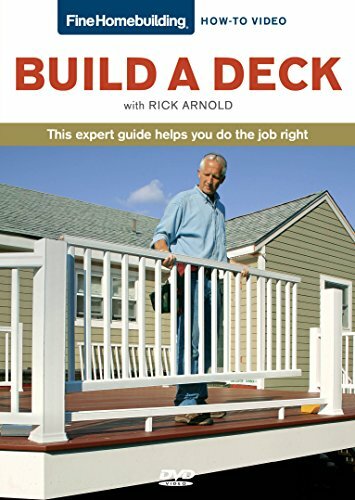 With this video guide you'll have the confidence and the know-how to build a deck that's sturdy, strong and safe - and one that enhances your home for years to come. If you have any questions about this product by Taunton Press, contact us by completing and submitting the form below. If you are looking for a specif part number, please include it with your message.